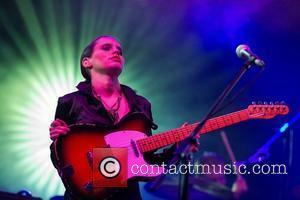 'Garrulous, loquacious, verbose, effusive, chatty'; this is not how you would describe Anna Calvi. Aside from name-checking her band and saying a couple of thank yous, Anna didn't speak tonight. Focused, possessed behind the eyes and as psyched as a matador facing down his prey in the 'tercio de muerte' would certainly more accurately describe her stage presence. In the serene surroundings of Hove's All Saints Church, Calvi took to the dimly lit stage below the magnificence of the vaulted ceiling of the late 19th century, still incomplete, J.L. Pearson designed, formidable parish church. 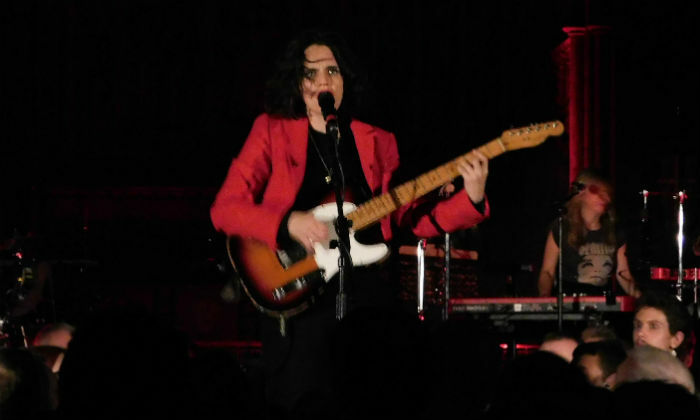 Dressed in signature red and black, with matching scarlet lips and tousled hair, Calvi substituted a muleta for a number of guitars as she mesmerised and delighted the crowd before her. With the recent release of her third, very well received album 'Hunter' just behind her, Anna had plenty of relatively new songs to showcase. In the thirteen-track setlist, it was her latest release that took up the majority, whilst her debut made up largely for the remainder. Anna's Mercury-nominated second album 'One Breath' was tonight assigned to history with not one of its original tracks given an airing. Anna unassumingly took to the stage and immediately struck up the opening chords of her debut album's opening track 'Riders To The Sea'; her undoubted and, at times, astonishingly good guitar craft already clearly evident. 'Indies Or Paradise' followed as Anna energised the room with the pulsating rhythms, squalling guitar passages and breathy vocal. The first of four consecutive tracks from Anna's latest record highlighted its excellence. 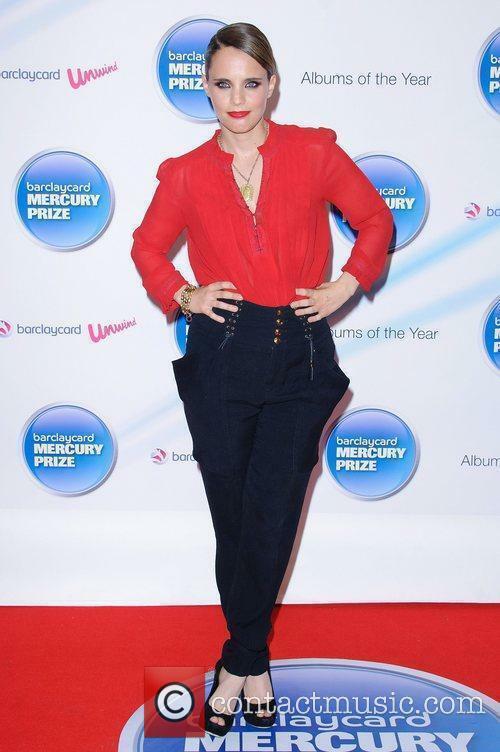 The next three tracks; 'As A Man', 'Hunter' and 'Don't Beat The Boy Out Of The Girl'; encapsulated Anna's exploration of the 'gender spectrum' and 'assigned sexuality' that she is keen to challenge on her new album. 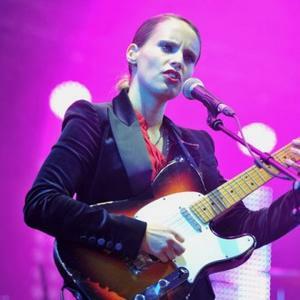 As Anna Calvi plays and sings you can't take your eyes off her. She may not say a lot but her performance is one that requires you to invest wholeheartedly so that you don't miss a note. Her virtuoso guitar solos, wild and manic contortions on the extended catwalk stage entranced the sell-out crowd. I don't think I've witnessed a collective group of people quite so spellbound at a gig as this; they were hypnotised and transfixed as one throughout a set that veered between the extremes of a soft gentle caress and a tornado's brutal intensity. Tonight's set was extremely well thought through and had a rhythm and cohesion that ensured it flowed seamlessly. There was the subtlety and tenderness of 'Hunter', the power-pop perfection of 'Don't Beat The Girl Out Of The Boy' and then there was the beautifully sweeping soundscape of set highlight 'Swimming Pool'. Anna positioned herself at the head of the catwalk stage to perform two tracks that segued into each other effortlessly. 'No More Words' headed up the sumptuous waves of the cinematic, almost 'Moonraker' era John Barry-like 'Swimming Pool', with Anna in total command of her audience. The vocal was so delicate but you truly could have heard a pin drop as she sang and played. Calvi increased the volume as she closed out her main set. Hunter's last track of the evening, 'Wish', was a fitting finale of new material ahead of a raucous and impassioned 'Desire'. Anna briefly departed the stage before she reappeared for a two song encore. Clear crowd favourite 'Suzanne And I' continued the thread of tracks from her debut album before she drew the night to a close with an intense take on Suicide's 'Ghost Rider'. Anna Calvi played brilliantly, with a stunning set of guitar performances but this gig, and this set, was not wholly defined by them. Her vocal was equally enthralling. Her range, depth, tone and evocation saw to it that her songs were delivered masterfully and her passionate, theatrical and dramatic performance made it all the more memorable.